Did you know lemon has other uses beyond cooking and baking? It also has great benefits for your skin. They can be used as for exfoliation, blackhead removal, sunburn relief, scar or dark spot prevention, and skin brightening. And did you know you can use lemon juice for blackheads? Is Lemon Good for Blackheads? The alpha–hydroxy acid naturally prevents acne, blackheads, pimples, or any other skin problems from forming. The citric acid and natural astringent property helps to tighten pores which removes and further prevents blackheads. The acidic property and natural oils help to gently exfoliate and cleanse oily skin and prevents bacterial infections. It removes impurities, oil, and other dirt by deep penetration, thus enhancing skin tone. It is packed with vitamin C, calcium, and potassium which are very effective for skin and hair care. It reduces oiliness and nourishes and brightens the skin complexion to not only remove blackheads but also clear acne, acne scars, blemishes, freckles, and dark spots. 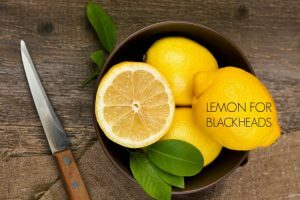 Using lemon for blackheads is becoming increasingly popular, but it also helps many other skin problems. Unfortunately, these methods may cause dryness, itching, and irritation if applied directly on dry or sensitive skin. If repeated regularly, lemon is an excellent remedy giving wonderful results for skin problems. Collect freshly-extracted juice in a small bowl. Dilute with a small amount of water. Apply directly to affected skin with the cotton ball. Wash off by gently scrubbing it. Repeat 2 – 3 times a day for best results. Note: Applying lemon juice directly without dilution on the skin causes irritation, itching, and redness, especially with sensitive skin. Squeeze a fresh lemon to extract its juice into a bowl. Add small amounts of honey, yogurt, and salt. Mix well to make a fine mixture. Gently scrub for 3-5 minutes. Let it sit for one minute. Note: You can substitute yogurt for fresh milk. These contain toning, anti-microbial properties which are suitable for treating blackheads. Add equal quantity of rose water. Let it sit for about 15 – 20 minutes or until it dries completely. Rinse with cool water, gently scrubbing. Note: You can substitute rosewater for regular water. Honey has natural anti-oxidant, anti-bacterial, and anti-septic properties that help remove blackheads. Honey also hydrates and tightens the skin pores and works with lemon to remove blackheads. Lemon has vitamin C and bleaching property that helps to clear the blackheads effectively on skin. Warm honey for a few minutes. Dip half a lemon in the warm honey. Note: You can substitute raw honey for normal honey (without heating it). Gently rub the slices on the affected areas. In this process, lemon kills the bacteria as the oats exfoliate the skin absorbing the excess oil and honey adds essential moisture to the skin. Combine freshly extracted juice, rolled oats, honey, and water in a bowl. Stir well into a fine scrub. Gently scrub in circular motions to affected areas with your fingertips for at least 40 seconds. Combine baking soda and granulated brown sugar in a bowl. Apply to damp skin, gently scrubbing and massaging with your fingers while concentrating on dry patches and affected areas. Blend oatmeal, juice, and yogurt into a fine paste. Apply to your entire face while avoiding the eye area. Let it sit for about 15 – 20 minutes to dry completely. Mix fresh milk and fresh-squeezed lemon juice. Let it sit for 5 – 10 minutes allowing it to dry. Cinnamon removes excess sebum on the skin’s surface to clear blackheads and lemon tightens up the skin pores to prevent its recurrence. Squeeze half a lemon into a bowl with a sufficient amount of cinnamon powder. Mix well into a smooth paste. Apply to your entire face before bed, leaving it on overnight. Repeat until you observe visible results. Note: You can replace lemon juice for lime juice. Remove the peel from pomegranate seeds and cut it into pieces. Dry roast the peel and grind it into a powdered form. Mix a sufficient amount of the juice with the powder to make a paste. Note: Apply overnight for even better results. Combine freshly-squeezed juice, milk powder, and water to make a paste. Gently scrub the paste on the affected areas for 5-7 minutes. Gently rub the peel on the affected areas for 2-3 minutes. Leave the skin untouched for about 8-10 minutes. Note: This process also helps to cure acne, acne scars, and dark spots on skin. Citric acid in both lemon and tomato acts as effective blackhead fighters. Oatmeal acts as a gentle exfoliator to remove dirt, oil, and dead skin cells from pores to prevent blackheads. Remove the skin from the overripe tomato. Blend the tomato to make a puree or juice. Add equal quantities of freshly-squeezed juice and instant oatmeal and stir well. Wash your face thoroughly with water. Apply mixture all over your face, focusing on the affected areas. Let the mask sit for 15 minutes or until it dries naturally. Blackheads will occur on children’s ears when the skin is not cleansed properly. Stir equal quantities of fresh juice and boiled milk. Apply the mixture to the blackheads in the ear and let it dry. Squeeze the blackheads gently to unclog the pores or glands, making sure to avoid rubbing or scraping to decrease risk of infection. Note: Consult a dermatologist if problem persists or worsens. This acts as a natural toner effective for treating blackheads on your nose and face. Mix equal quantities of lemon extract and olive oil in a small bowl. Dab a saturated cotton ball all over your face, concentrating on your nose. Repeat daily until you observe visible results. Sugar balances the lemon acid and lemon juice helps to lessen the roughness in sugar to avoid any harm to the skin. Stir a sufficient amount of sugar and juice to make a thick mixture. Gently scrub the mixture on your face, focusing on your nose. Combine freshly-squeezed juice and warm water in a bowl. Stir well. Splash your face with the misture. Combine an egg white, freshly-squeezed juice in a bowl. Stir well. Apply as a mask to a clean face. Mix equal quantities of juice and groundnut oil in a small bowl. Let it sit for about 20 – 30 minutes or until completely dry. Mix equal quantities of lime juice, almond oil, and glycerin in a bowl to create a lotion. Regularly apply the lotion every morning for blackhead relief in a week. Simply rub the lemon rind on the blackheads, leave overnight, and rinse with cold water in the morning. Try using lemon-based organic products such as face washes, soaps, and creams. Drink at least an ounce of lemon juice twice daily to quickly rid blackhead scars. Pour juice and a few drops of water on a toothbrush and gently scrub the affected areas in a circular motion. If you have dry or sensitive skin, avoid applying lemon directly on the skin as it will increase dryness and cause irritation and itching. Do not enter direct sunlight for at least an hour after applying juice as it will make the skin more sensitive. It is best to do a test on a patch of skin before using any treatment all over your face. If you do not suffer from any side effects like irritation, excessive dryness, or burning sensations, proceed with the treatment. If you’re undergoing any skin treatment, consult your doctor attempting these methods to prevent any side effects. Apply sunscreen lotion before entering direct sunlight to avoid side effects. Apply natural or chemical-free moisturizer to prevent dryness. Everyone’s skin is different and will react differently to these methods. Consult your dermatologist if the problem worsens. You can try any method mentioned above in the article. Apart from that, it is better to exfoliate the blackhead areas at least 3 times in a week. Umm I tried the lemon and cinnamon and I got a huge red reaction to it..?? I kept it on for around 3 minutes until it started to burn so I immediately took it off and I was all red!! Now what?? For remedies related to sunburn you can read this article – http://homeremediesforlife.com/sunburn/. For blemishes you can try the remedies mentioned in this article – http://homeremediesforlife.com/brown-spots-on-skin/. my face skin is oily and having many darkened areas on chin below lips , below eyes and fore head and neck. what can i do for face? Also what should i do for darkening / tanning of hands from the triceps to fingers and also elbows ? can u suggest , how to get my colour back ? You can try skin whitening methods. To know about these methods read this article – http://homeremediesforlife.com/skin-lightening/. Apart from that apply sunscreen lotion before going out, exfoliate regularly to remove the accumulated dead skin and apply moisturizer regularly. my face and nose has blackheads also i have dark spots and open pores what method should i use? Try any method mentioned in the above article for removing blackheads. As lemon contains citric acid, it shrinks the open pores while its bleaching properties lighten the dark spots. So, apply the lemon juice on dark spots and open pores, leave it on to dry completely and rinse off with water. Repeat the process regularly. do i apply the lemon juice directly? can i rinse it with normal water or must it be cold? You can rinse it with normal water as well. It doesn’t necessarily have to be cold water. If I apply lemon and get rid of blackheads then what will I do about those deep blackhead scars? The astringent properties of lemon shrink the pores. The bleaching properties of lemon lighten the blackhead scars. Is it pimple? I don’t know but its size are small,very small and colour is red I think it is pimple I have also blackheads…. You can try any process mentioned above to remove whiteheads as well. I am 33 years old, have very oily skin, and what worked as my blackhead toner was the Made from Earth Skin Correcting Toner. Just a few spritzes after I wash my face, I see a noticeable difference in my blemishes and blackheads (3 months now). This makes my face feel so soft and smooth. I originally purchased this to use as a setting spray, and it of course works very well for that, too, it’s just that I don’t wear full makeup that often.